Fry the onion in the oil until it start to looks transparent. Add the garlic, water/stock & sweetcorn and bring up to a simmer. Add the smoked paprika and blitz with a stick blender until smooth and creamy. Taste and season as necessary. Shared with Lisa’s Kitchen & the No Croutons Required challenge. Love sweetcorn soup, especially that this recipe is super quick. Those griddled aubergine and goats cheese towers look fab too. I am going to make this for my kids who adore sweetcorn. Love the smoked paprika. As for a friend who does your tax return?? You are a lucky woman indeed! hehehe, you are my kind of cook! I am miss impatience and anything that takes more than half an hour seldom happens! Haha, this made me laugh Jane – that onion soup has registered deeply in your psyche. I’m rather liking this more instant version of soup – trundles off to check freezer. Soup is real soul food isn’t Nayna. Janie, one of my favourite soups. How delicious! It is such an easy peasy one isn’t it Lizzy! Woohoo! One for me and it looks like a keeper. 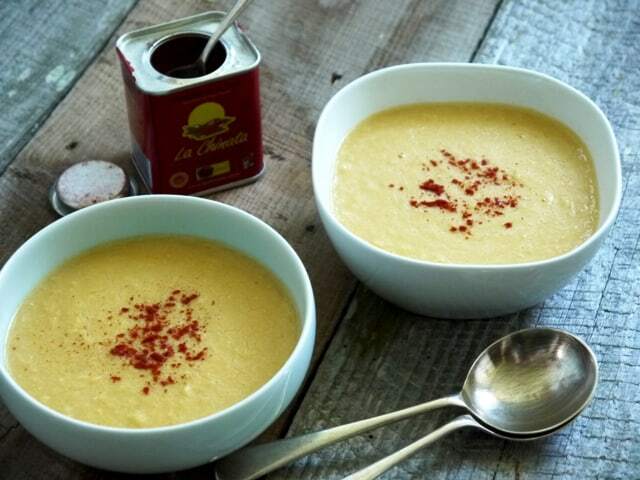 I really like sweetcorn soup, but I am loving the addition of paprika in this! Thanks Dannii, it was a tasty addition! Smoked paprika is such a staple spice isn’t it? I love how it makes a meal taste meaty (like it has bacon in it) without adding any! Thank so much for popping by Nazima! A BRILLIANT little recipe to have tucked away for an impromptu meal Janie! SOUPER! Sorry! tehehe love how the 9 hour gruelling session keeps popping up when u say soup! I am a great fan of sweet corn and sweet corn chicken soup is my abso fav I can eat it day in and day out and never tire of it! I would enjoy a bowl of this warming lovely soup. Thanks for submitting to NCR. I would however appreciate a link back to site is that one of the requirements for participating in our event. Thanks in advance.